When I moved to town and was compiling a list of interesting things to do nearby, one of the first things that drew my attention was the W.A. 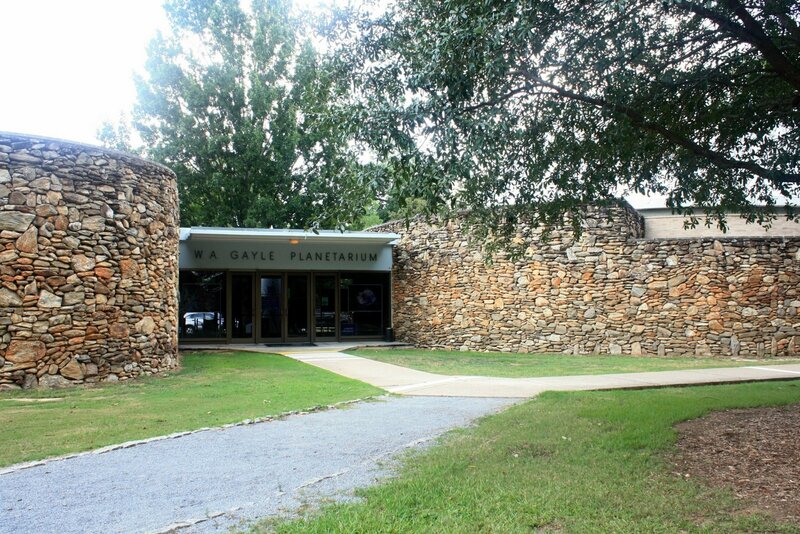 Gayle Planetarium. I’ve had a fascination with planetariums for so long, I can’t even remember how it began. It belongs to that part of my childhood when I yearned for chemistry sets, microscopes, and telescopes but was too shy to ask for them directly. In grad school, I decided to start getting myself the gifts I’d always wanted but could now in no serious way request. The summer after I finished my masters, I built and painted a birdhouse, much to the delight of my fat cat who perched in the window I’d placed it outside. I got a microscope and made slides of my own blood and eyelashes, but it turns out a $20 microscope from Target is only good at illuminating the flaws in its own lenses. At least I had the wisdom to forgo the chemistry set and focus on cooking, whose chemistry at least yields tasty results. While I’ve steadily developed the portion of my bookshelves dedicated to field guides of the night sky, I’ve always struggled to make a connection between the tiny, but clearly labeled, diagrams and the vast wildness of the actual night sky. Perhaps it’s because I’ve never managed to acquire red film for a flashlight so I could go back and forth between my books and the sky without having to readjust to the dark — or because the sky is so changeable and full of surprises and more often than not blocked by some urban obstacle to clear viewing or just faded by the city’s ambient lights. Today I finally went to the W.A. Gayle Planetarium, my first visit to a planetarium ever, and it was a treat. Of course, like chemistry sets and the type of microscopes and telescopes that kids get for gifts, it is designed largely to appeal to children. But it is of a whole other order of impressiveness, and the big kid in me was thrilled. The show that I saw was called “A Trip into Space.” The shows vary, and many are narrated by former Star Trek cast members. The planetarium, owned by the City of Montgomery and operated by Troy University, sits on the grounds of Oak Park. Forever the Montgomery neophyte, I was confused about where to park. There’s only one entrance to the park, on Forest Avenue. Veer to the right at initial split in the road, and keep going almost until you’re out of the park. Don’t be confused like I was confused by signs labeled “Planetarium Parking” whose arrows point left, seemingly into the grass; they just mean carry on down the left-veering loop of Oak Park Drive. The third sign pointing to the left does have a dirt driveway and parking area and notes that it’s for cars only, and that’s where you should park. The Gayle Planetarium and its white dome hide behind horseshoe pits and trees. 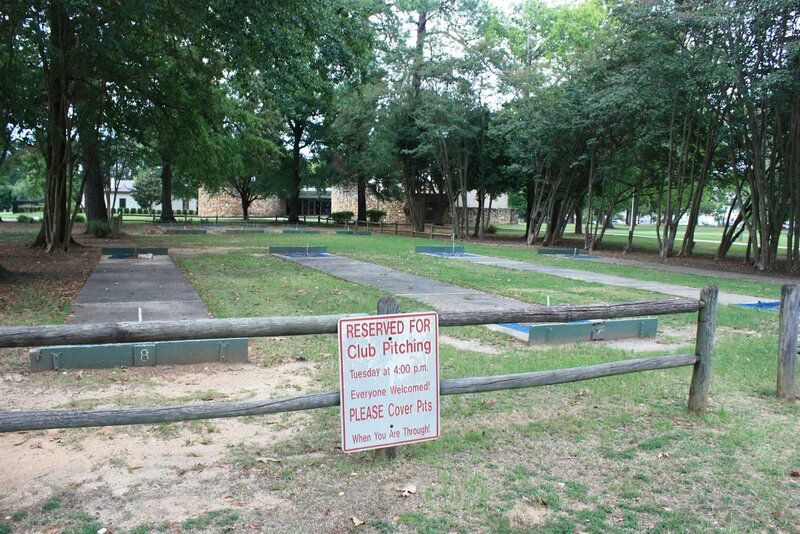 After a quick walk through the horseshoe pits (“Reserved for Club Pitching Tuesday at 4:00. Everyone Welcomed!”), I found Trish Jester, planetarium specialist, holding the door open for me. She’d been keeping an eye out for me after I’d called for directions while wandering the park grounds lost. Tickets are but a mere five dollars. Even though I was taken with the trinkets in the colorful gift shop and the various signs and telescopes on display, I quickly made my way to the darkened auditorium. As school hasn’t started yet, there were no busloads of school children to compete for space with — only two grandparents and their grandchildren. I heard the grandmother explain how she’d been to Florida to see rockets shoot into space, her grandchildren almost disbelieving in wonder. I think I enjoyed the show more with them there. The young boy’s constant oohs, ahhs, and wows were a secondary soundtrack that reminded me how magical the reality of space seemed to me as a child (and still does). 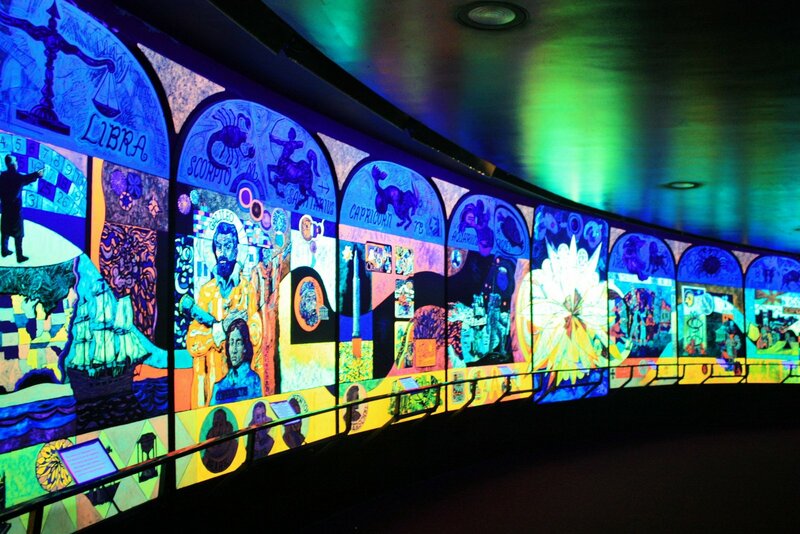 A DayGlo mural of the constellations on the hallway to the domed theater. Our planetarium (Can I say “our”? If it’s the city’s and we’re Montgomerians, then it’s mine and yours, isn’t it?) with its fifty-foot dome, is the second largest southeast. It was built in 1968, as a part of the boom in planetariums during the space race when the public was enthralled by exploration. 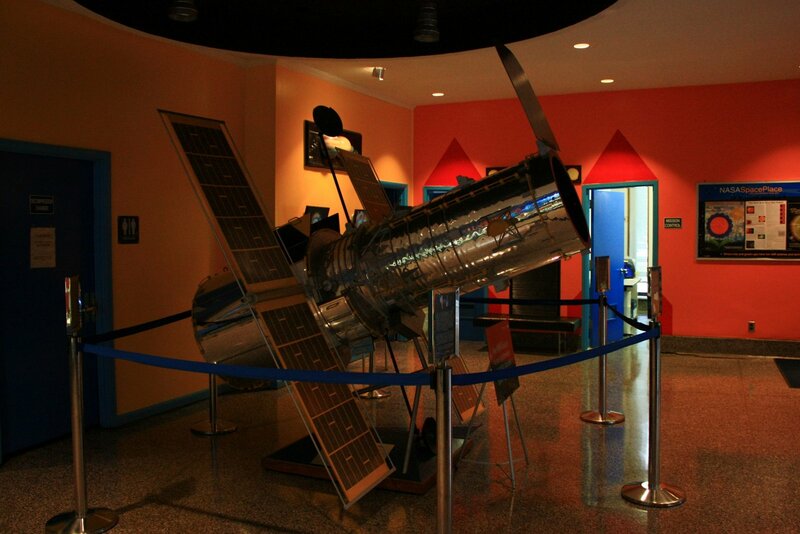 Its Spitz STP (space transit projector) dominates the room and itself resembles a space station or satellite. As it was one of only eleven projectors of its kind ever made — and only one of two still in operation — it’s very difficult to find spare parts or technicians who can work on it, and it’s functioned well past the twenty years it was designed for. As beloved at the Spitz projector is, it shows its age. 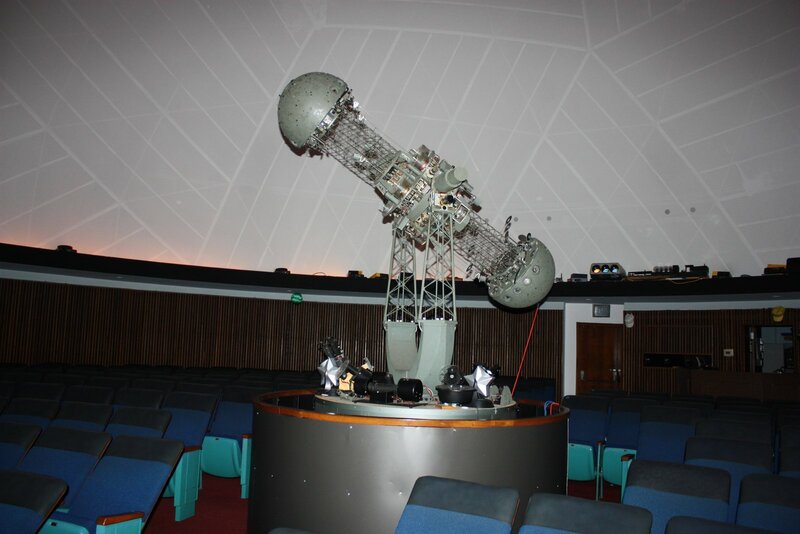 The lamp for the southern sky has blown leaving a part of the planetarium dark, and without that lamp, a bungee cable is required to keep it balanced, but immobile, making it impossible to rotate to show the day-to-day variation in sky. Jester told me that the planetarium has made a proposal to the city for an upgrade for an all-digital projector that would be able to zoom to different celestial bodies at the stroke of a key and which wouldn’t obstruct any views. Still, the show was impressive, and that young boy’s breathless awe demonstrates the planetarium’s power to engage and fascinate young minds. I can’t wait to take my niece. The planetarium is a major draw to the city. Ms. Jester said that not only do individuals frequently travel from Mobile and Birmingham to visit, but school children from all over the state and from surrounding states travel to see the planetarium as well. It is certainly one of Montgomery’s shining stars. If you’d like to find out how you can help support the planetarium in its proposal to update its projector, call 334-241-4799 for more information. Public shows are daily at 3 p.m. and cost five dollars. There is no late admission. In addition to field trips, the planetarium can also accommodate birthday parties, proposals, wedding parties, anniversaries, and family reunions. The website is http://montgomery.troy.edu/planetarium/. On a related note, the closest astronomy group is the Auburn Astronomical Society. Jester told me that they’re hosting a star party this weekend, as it’s the new moon. Like most groups these days, they have a Facebook page. I’m adding “star party” to my list of things to do. 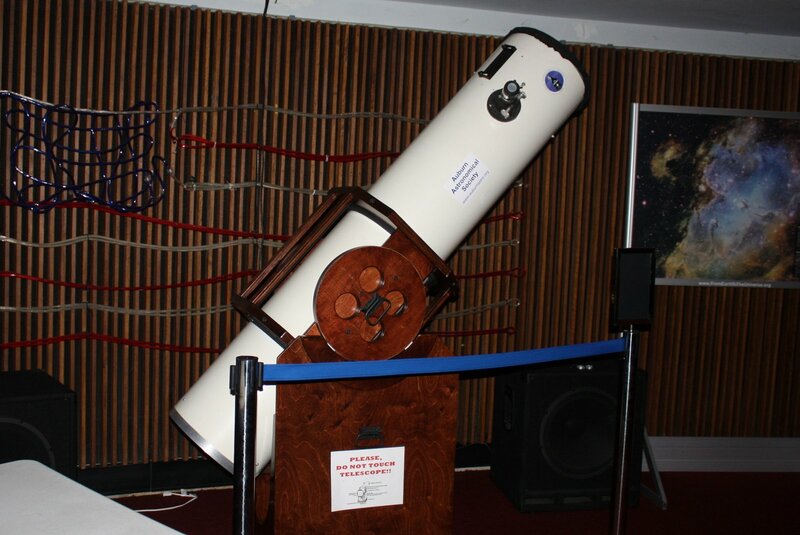 A Dobsonian telescope handmade by the Auburn Astronomical Society. Jesseca Cornelson is an Assistant Professor of English at Alabama State University and has been a resident of Cloverdale for a year now. She grew up in Mobile and did her graduate studies in the Yankee North, earning degrees at The Ohio State University and the University of Cincinnati. She blogged about her visits to Montgomery to do research at her now-defunt blog, Difficult History, and was recently a Platte Clove Artist-in-Residence, sponsored by the Catskill Center for Conservation and Development. Thank you so much Jesseca Cornelson for the wonderful article. I wanted to let you know that we did indeed get our new projector and in March 2014 re-opened with a new digital full dome SUPER MEDIAGLOBE II projector. It is fantastic! 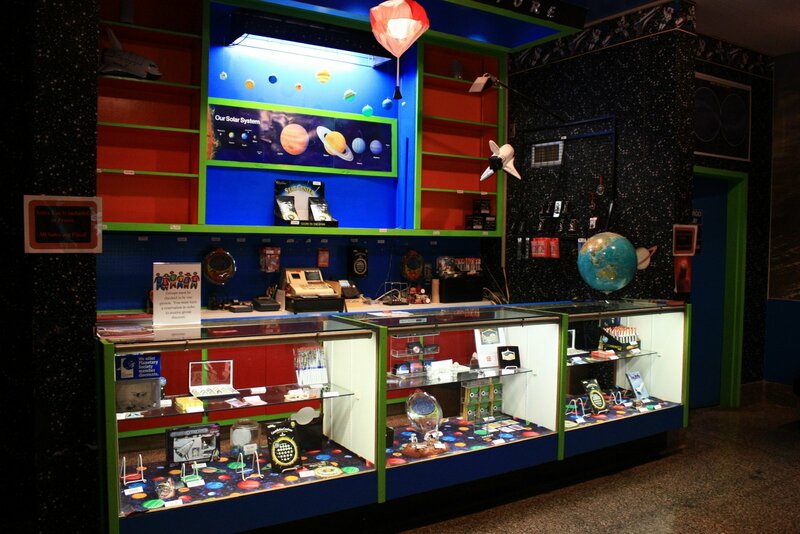 We have changed hours and admission rates since your article and I am including a link to our FB page https://www.facebook.com/gayleplanetarium/ and our website http://troy.edu/planetarium/ for more updated information. We do hope to see you again soon! !